Read the PDF of this study here. Jule Schultz, Jerry White Jr. Thank you to members of Spokane Falls Trout Unlimited, Inland Empire Flyfishing Club and all other Citizen Scientists who made this report possible. Sediment pollution in Hangman Creek, also known as Latah Creek, is a well-known and studied occurrence (Joy, 2009). Monitoring throughout the basin shows high levels of sediment and turbidity (See River and Stream Flow Monitoring, WRIA 56), with almost 200,000 tons of sediment exiting the system in a high water year (SCCD, 2002). The Washington State Department of Ecology (Ecology) lists the creek “impaired” for sediment (Joy, 2009), citing sediment loads that violate the designated use of “salmon spawning, rearing, and migration” and increased by land use practices in WRIA 56 (Hangman Creek). Sediment pollution and the resulting turbidity negatively impacts fish and macroinvertebrates, with the effect compounding with both time and intensity of the event (Berry et al., 2003). Impacts of sediment pollution in Hangman Creek in Idaho show lethal and sub-lethal effects to trout (Peters, Kinkead, and Stanger, 2003). Not surprisingly, most of the Hangman Creek watershed does not contain native redband trout, although records suggest they once thrived there (Joy, 2009). The Spokane River still contains a “fishable” population of native, wild redband trout, although populations of these fish are lower than that of similar rivers in Idaho and Montana (Lee, 2017). Little is known about the effect of sediment loading from Hangman Creek on the Spokane River. Washington State Department of Ecology currently samples at the mouth of Hangman Creek and downstream of the Hangman mouth at the Spokane River at Riverside State Park and at the Nine Mile Bridge. These data, from monthly sampling events, suggest that turbidity from Hangman Creek influences the Spokane River. Hangman Creek is notoriously flashy watershed, sometimes rising and falling thousands of cubic feet per second in a day, bringing with it the associated sediment. Monthly sampling is not sufficient to capture these flashy events. More frequent sampling will record the intensity and duration of Hangman Creek’s sediment plume in the Spokane River. Hangman Creek flows into the Spokane River at Peoples Park, downstream from downtown Spokane. At the confluence during periods of high, turbid flow, the contrast between the muddy waters of Hangman Creek and clear water of the Spokane River is stark. The unmixed turbid waters of Hangman Creek flow over prime spawning habitat for redband trout in the Spokane River (Addley and Peterson, 2011). The duration and intensity of sediment and the resulting turbidity pollution in the Spokane River may causes adverse impacts to native redband trout, but little is known about these pollution events. High concentrations of sediment coupled with high flows of Hangman Creek can cause high turbidity levels in the Spokane River. These events typically occur during the spring snowmelt season, which coincides with redband trout spawning and rearing. Hangman Creek may also display high sediment concentrations during low flow seasons in late spring due to thunderstorms or heavy precipitation. 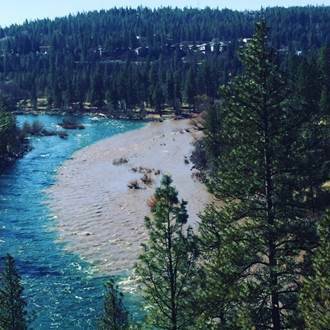 These events may not pollute the entirety of the Spokane River with sediment due to the high flow of the Spokane River and low flow of Hangman Creek, but will produce measurable turbidity immediately downstream in the Spokane River. Turbidity readings will be taken from Hangman Creek and the Spokane River above and below the mouth of Hangman Creek between December 1, 2017 and July 1, 2018. Samples will be taken in Hangman at the 11th Street Bridge and in the Spokane River at Sandifur Bridge, at Riverside Memorial Cemetery, and below the TJ Meenach Bridge. Turbidity will be determined using a transparency tube and recorded in centimeters. The transparency tube functions as a modified secchi disk, with a black and white disk located at the bottom of clear tube. The volunteer will fill the 60 cm tube with water, look into the opening of the tube from above, let out water by releasing the stopcock until the disk is visible, and record the height of water remaining in the tube (photo at right). Readings from Sandifur Bridge samples will be compared to readings from the Riverside Cemetery and TJ Meenach samples to determine the effect of Hangman Creek on the Spokane River. Volunteers will be scheduled at the beginning of the sample period of Dec-June at regular intervals, as not to bias the sampling frequency or target turbidity events. In locations where the river/creek is not accessible from land, a jar/bucket will be lowered into the water with a rope off of a bridge. Water will be hauled up in the container and analyzed for turbidity. Volunteers will take photos of the sediment plume from the corner of Summit and Broadway on the Centennial Trail during each monitoring run. Photos will be combined to visually show the impact of Hangman Creek on the Spokane River. Staff from the Spokane Riverkeeper will train all volunteers. 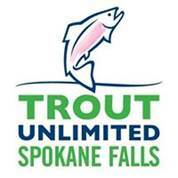 Instructions and an instructional video will be available on Spokane Falls Trout Unlimited Website. Volunteers will report results on the Spokane Fall Trout Unlimited website using the reporting form. The safety of volunteers should take priority over any data collection. Please do not attempt to take water quality samples in slippery conditions, such as on ice or snow. Figure 3. Sampling locations for turbidity on Hangman Creek and the Spokane River. Volunteers collected 238 data transparency readings from four locations in Hangman Creek and the Spokane River. Data in Table 1 show that Hangman Creek contained very turbid water, with a median value of 21.3 cm and a minimum of 3 cm. Directly downstream of the confluence with Hangman, the Spokane River at Riverside Cemetery showed similar results with a median transparency value of 21.3 cm and a minimum of 2.5 cm. Upstream of the confluence with Hangman, the Spokane River at Sandifur Bridge rarely saw measureable turbidity. Values at TJ Meenach Bridge, about four miles downstream from the confluence and where waters are well mixed, saw minimum values of 6 cm, but a median of 60 cm, which is the length of the turbidity tube. Hangman Creek contained detectable turbidity (<60 cm) in 91% of samples. The lowest readings occurred in January and March, with February and late April and May containing the clearest waters. Figure 5. Transparency readings in Hangman Creek, Winter and Spring 2018. 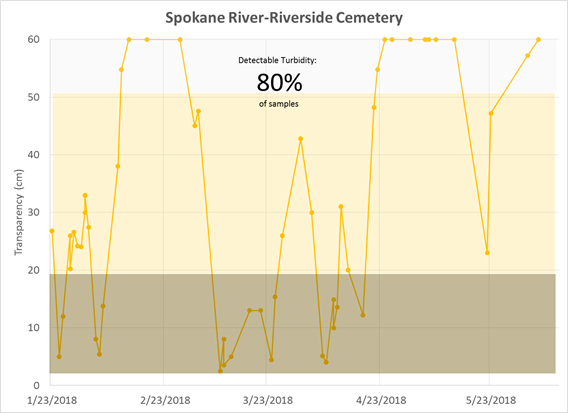 Directly downstream from the confluence of Hangman Creek and the Spokane River, the samples at Riverside Cemetery contained detectable turbidity 80% of the time (Figure 6). The sample period began later (January 23rd) than that of Hangman because the sample location was added at the request of the samplers. This sample station mirrors the patterns in Hangman Creek. Figure 6. Transparency in the Spokane River just downstream of its confluence with Hangman Creek. Samples at TJ Meenach Bridge contained detectable transparency about 30% of samples. These samples represent a section of the Spokane River that contain well-mixed water. Samples contain low transparency at similar times to Hangman Creek. Figure 7. Transparency readings in the Spokane River at TJ Meenach Bridge, where the Spokane River and Hangman Creek are well mixed. Hangman Creek pollutes the Spokane River with sediment for much of the winter and spring at levels that almost certainly impact native redband trout. The duration and intensity of the pollution varies in the Spokane River based on location, but in some cases turbidity is so widespread and intense it cannot be avoided. Hangman Creek had a measureable influence on the transparency of water in the Spokane River in 30% to 80% of samples. In a poorly mixed area near the confluence of the two streams, transparency mirrored that of Hangman, while in well-mixed areas of the Spokane River, patterns of transparency were similar, but the effect smaller. High flows in the Spokane River diluted the sediment load of smaller Hangman Creek, resulting in clearer water at TJ Meenach Bridge in some cases. Where y=turbidity in NTU and x=transparency in cm. This calculation was developed from common conversions contained at https://extension.psu.edu/fish-understanding-your-transparency-tube-measurements. These conversions show that transparencies under about 60 cm (the detectable limit in this study) convert to greater than 8 ntu and 51 cm = 10 ntu. Fish begin to show signs of stress at 10 ntu and the turbidity standard in Washington State is “5 ntu above background”. Calculations from Hangman Creek transparencies show it exceeded the 5 ntu standard at least 91% of the time. Fish in portions of the Spokane River are significantly affected by the duration of sediment pollution from Hangman Creek. We find the Spokane River near the confluence of Hangman Creek has turbidity readings over 5 ntu at 80% of the time and over 10 ntu 75% of the time. This area has redband trout spawning and rearing significance. The intensity of turbidity may influence fish populations in Hangman Creek and the Spokane River. A transparency reading of 2.8 cm rough equals 980 ntu while 5 cm rough equals 380 ntu. These levels certainly produce sublethal affects in trout, such and respiratory and physiological distress. Exposure to those levels for a long enough time may produce lethal effects as well. Furthermore high turbidity levels occur in the Spokane River during the March-May spawning and rearing period for redband trout, further affecting trout populations. Transparency readings in the Spokane River above the confluence with Hangman Creek at Sandifur Bridge only were detectable once, showing that almost all of the turbidity in the Spokane River below Hangman Creek originated in the Hangman Creek watershed. The 70 sample runs this study completes fills a gap in knowledge about turbidity in the Spokane River from Hangman Creek. To accurately determine the extent of the effect, what is needed is a study using continuous turbidity data loggers in the Spokane River system. Continuous turbidity data could be converted to total suspended solids (TSS) to accurately determine the effect (severity score) on fish in the river. This would more accurately show the effect of Hangman Creek on Spokane River’s native redband trout. Berry W, Rubinstein N, Melzian B, Hill B (2003) “The biological effects of suspended and bedded sediment (SABS) in aquatic systems: a review.” US Environment Protection Agency, National Health and Environmental Health Effects Laboratory, Rhode Island, USA. Peters, R.L., B. Kinkead, and M. Stanger, 2003. Year-end Report 2001-2002. Implement Fisheries Enhancement on the Coeur d’Alene Indian Reservation: Hangman Creek. BPA Project # 2001-032-00. Coeur d’Alene Tribe Department of Natural Resources Fisheries Program. Plummer, ID. 189 pages.